The aim of the CD-ROM is to assist Primary and Secondary care clinicians in developing their competence and confidence in gynaecological and sexual health history taking, carrying out a speculum and bi-manual examination, taking a smear and swabs in addition to offering a review of the menstrual cycle and a short quiz. The idea is to assist in the education of Advanced Nurse Practitioners in Primary Care and is also suitable for clinicians in all settings where gynaecological skills are needed. Often it is difficult to gain these skills in practice and this CD-ROM gives the opportunity to review these skills individually, as a group or in an educational forum. It is also a useful refresher. 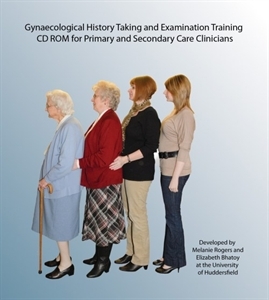 This interactive CD-ROM includes a series of videos which take the viewer through history taking, examination skills, the menstrual cycle and an interview with Sian Jones, Consultant Gynaecologist, Bradford Royal Infirmary offering tips to improve your competence. It was developed by Melanie Rogers (Advanced Nurse Practitioner/Course Leader-University of Huddersfield) and produced by Elizabeth Bhatoy (Bsc Computer Studies- University of Huddersfield) with assistance from Sian Jones, Consultant Gynaecologist-Bradford Royal Infirmary, Kathy Carpenter (Advanced Nurse Practitioner-The Ridge Medical Practice) and Alison Bramfitt (Advanced Nurse Practitioner-NHS Bradford and Airedale). A single unit: £49.99 + VAT plus postage and packaging. Please contact enquiries@medipex.co.uk if you would like a discount on multiple copies of this CD-ROM.